Kol Isha: There is so much to say about this album, I don’t know where to start. Should I start with Benny’s magical voice which shines no matter what genre he sings? The dazzling array of compositions and arrangements by some of the best in Jewish music today? The multi-faceted harmonies and choir work by Moshe Roth, Yitzy Spinner and 8th Day? The fabulous instrumentation by Avi Newmark’s Nagila Orchestra? The gorgeous booklet designed by the prolific Sruly Meyer who never fails to surprise us with his creativity? Master chef Avi Newmark intricately combines all the ingredients and presents us with a musical feast that leaves us all drooling. A word of caution. When a CD is hyped as much as this one, you might expect to listen once and instantly fall in love. No matter how good an album is, that generally doesn’t happen. You need to take the time to get to know the songs, hear all the nuances and take it all in. 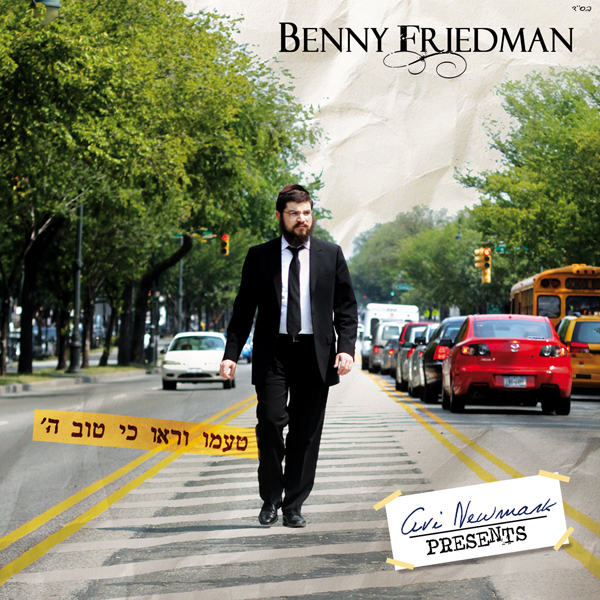 Not everyone out there is going to become a Benny Friedman fan. But I suspect that most of us will and that Avi Newmark has given us another Jewish music superstar. Hislahavus: Benny is an exciting new artist, as his voice, incredible range and raw ability project to some great stuff in the near future. I’m really impressed by his voice. He’s got some creativity, too, which is fun. At the same time, half the tunes on the album are fairly typical. They aren’t bad, by any means and in fact, they’re nice – but that’s due to Benny’s fine vocal skills. If virtually any other artist I can think of would try some of these things, I’d rip ‘em to shreds. But Benny’s voice is pleasant, and simply a joy to listen to. When he hits the outer reaches of his vocal limits, he doesn’t screech or scream, unlike so many other artists who want to show you how high they can go. The backup choir? Eh. In most songs, you have a choir of Israelis who can’t seem to get the accent right (e.g. “esreh” versus “esray”), which sounds cumbersome. They sound similar to the background vocals of Mendy Jerufi’s Veyadaata – flat. The best moments come when Benny is overdubbing himself, or when 8th Day kicks in. Would that I could get a copy of the master! But by the second half of the album, Benny really does a great job – some great word-spitting on Moshiach and Emes, some vocal surfing during Amar, and simply beautiful work during Batuach Ani. While I like the first half of the album, I love the second half. MISOD – Composed by Elimelech Blumstein. Arranged by Ian Freitor. JMDerech: This song is without a doubt, a top notch intro for this highly anticipated debut album. All parts of this song flow in perfect unison. Kol Isha: This catchy, upbeat song is the perfect opener to this album both from a lyrical and musical standpoint. On a different CD, this song could have been the hit of an album, but on an album like this it is just an appetizer. Something to get your appetite going and make you wonder what’s coming next. While this is a really good song, you know that it’s just going to get better and better from here. I promise you it does. Hislahavus: Nothing out of the ordinary here, besides for the fact that Benny makes no rookie mistakes. The one thing about this song is that it doesn’t deserve almost six minutes of play time especially as it doesn’t really develop into anything special. Decent song – fairly stereotypical of the Jewish music genre. But I love the choice of words for Benny’s first song. NO LYRICS – Composed by Yitzy Waldner. Arranged by Ian Freitor. JMDerech: Hip Hop meets Niggun. The vocals are excellent, but the arrangements are even better. Kol Isha: If you thought Benny Friedman was going to sound like everyone else out there, you thought wrong. Fasten your seat belt. No Lyrics, despite its absolutely bizarre name, will grab you, take hold of you and never, ever let you go. You will find yourself singing this one over and over again. It is, hands down, my favorite song on the album, one of those rare songs that I fell in love with the minute I heard it. I am guessing that Ian Freitor gets a lot credit for taking this song and absolutely blowing it out of the stratosphere. Don’t miss the fun at 3:15 – 3:22. Hislahavus: Reminds me of Yanni. I can see why people will like it – it’s cute, catchy, and fairly unique. But to me, and I’m pretty sure I’ll be in the minority, there’s simply no tochen – no spiritual guts to the tune. I wouldn’t call it a niggun, because it doesn’t have a spiritual feel to it at all. But it’s cute. UKSHEIM- Composed by Yitzy Spinner. Arranged by Moshe Laufer. JMDerech: Not the best slow song on the album, but every time I hear the beginning of the chorus with the words “Hashem Elokeinu” it sends happy tingles throughout! 6:18 is heaven in a song. Kol Isha: I couldn’t imagine that any song would be able to follow the intensity of No Lyrics, but this touching tribute to Izzy Taubenfeld of Sameach Music is up to the task. Yitzy Spinner’s composition with perfectly chosen lyrics is beautiful, intricate and you need to listen more than a few times to appreciate just how gorgeous and sophisticated it is. Make sure you catch Benny at 6:18 to hear what an amazing range he has. The harmony at 6:48 is another can’t miss moment. While Moshe Roth’s choir does a nice job, I think if Yitzy Spinner had done the choir, he would have taken this song and really made it fly. Hislahavus: A decent song. It’s only flaw is that like Misod, it’s stretched out too long – 7:17. Pull out your lighters for this one. TAAMU – Composed by Shmuel and Bentzy Marcus. Arranged by Avremi G.
JMDerech: On any other album, this could have been the best song. On an album filled with juicy songs, like this one, it’s not quite at the top. Here’s the problem. Benny didn’t save any good songs for his next album! He used so many good compositions on this one, that those which could have been hits (like this one) on another album don’t shine as much, because they are surrounded by even better songs. For those who didn’t understand what I just said, note this: This is a really good song. Kol Isha: While on an album of this caliber, this isn’t one of the best songs, it is a good one and I love the feel of it. And can anyone else remember anyone using Havaya instead of Hashem? Awesome! And the “Taamu” stickers that were plastered around varied Jewish neighborhood? Brilliant! Hislahavus: I flipped when I saw the lyrics, and heard Benny’s gorgeous rendition of the bridge (taken from a story of the Baal HaTanya, retold by the Lubavitcher Rebbe. I actually thought they were going to use the recording of the Rebbe – as David Lazzar did on Johnny, Johnny, but they didn’t.) The message is phenomenal, but the tune doesn’t match up with the power of the message. So, another average song, but it’s got a great ending! HAMERACHEIM – Composed by Rabbi Simche Friedman. Arranged by Leib Yaakov Rigler. JMDerech: Chazzunos! Beautiful! “Lishmor Vilasos” is the part that really catches your attention. When he sings “OooLikayeim” it is really something. I don’t really care much for the beginning, but at the same time, it builds up to the climactic chorus. Kol Isha: This hartzig song was the most difficult for me on this album. I fell in love with the breathtaking clip that was used in the video trailer. But this wasn’t the song I expected to go with it. Not that this isn’t beautiful, but this isn’t a song as much as a davening piece and it just isn’t what I was hoping for. Benny does a magnificent job harmonizing himself. Pay attention at 3:01 – 3:15. He is simply beyond words. Hislahavus: Hameracheim is interesting – a cantoral tune, with no chazanus! Instead, Benny ably stretches his voice to the furthest extremes. To my ears, however, the beautiful arrangements seem to be quieter than they should be. The vocals sound “separate” from the music. That seems like it’s either an engineer’s mistake or attempt at artistic touch. Nevertheless, beautiful job. MOSHIACH – Composed by Yitzy Waldner. Arranged by Ian Freitor. JMDerech: This song should be called Boi Yavoi, considering the amount of times he sings those words compared to Moshiach. Okay… This song is SO GOOD! The refrain (low part) is so catchy, and chorus (high part) has a great ring to it. I love Yitzy Spinner’s choir vocals on this song. Talk about multiplying your voice! This is one of the songs that I keep playing over. This song starts the “Instant Hit” section of this album for me. Kol Isha: Wow…what a song! This is fun, different, catchy and Yitzy Spinner’s choir work, which makes this song really stand out, has me wondering why we didn’t hear more of his innovative choir on other songs. Again, I think Ian Freitor’s excellent arrangements are a large part of what makes this song so fresh. On any other album, this would have been the breakout hit. Here, it is part of a veritable smorgasbord of delectable music. KAD YASVUN – Composed by Meshulem Greenberger. Arranged by Moshe Laufer. JMDerech: I love this song. I play it over and over and over and over and over… then over some more. I always mimic the motions that Benny used on the preview video. You know? My arm moving back and forth in a swinging motion. I just wish I had a conductors stick thingy like he did. Don’t miss 4:48 when Benny goes up an octave. Last but not least, I beg you to listen to 6:21 when Benny reaches unknown heights with his voice. Kol Isha: This beautiful ballad flows so smoothly and really gives Benny a chance to show just how talented he is. Benny really shines at 4:48 and at 6:21 where he effortlessly takes it an octave higher. Wow! Simply stunning. Hislahavus: Kad Yasvun is sung Chasseedish – was this Benny’s nod to his Zaide? Whatever the case, it’s a beautiful tune, and again, when you have a talented voice such as this, it’s audible goodness. And sheesh, how does he hit those notes like that (6:21)?! And why does the piano have to continue going after his gorgeous ending at 8:00? AMAR – Composed by Yitzy Waldner. Arranged by Mona Rosenblum. JMDerech: I love the way Benny says the word “three”, so cute. Everything about this song makes me want to hop out of my chair and break into dance. I even tap on the keyboard and bop my head while typing this. SO catchy! Kol Isha: The moment the introduction starts you know this is going to be another wild song that manages to walk the fine line between unconventional but not too out there. This song is seriously contagious and you can’t help but find yourself singing “Shalom, shalom!” along with Benny. Listen carefully at 4:05 for some really funky stuff. From there until the end things get to be really fun. Hislahavus: A very tired, stereotypical song, BUT Benny lets his character take it over. I love the intro, but I wish the composition would have stepped it up a bit in the high part, because the “Sholom, Sholom” gets boring despite Benny’s best attempts at picking it up. Reminds me too much of “Salaam, Salaam”. The song sounds like it was composed as the closer for concerts, while songs should be composed because they’re emotional expression. That said, it’s still easy to listen to, and my two-year-old loves it. YAAVDUCHA – Composed by Bentzy Marcus. Arranged by Avremi G.
JMDerech: Ooooo!!! This song is so perfect. It’s so relaxing and melodious. I feel like I should be sitting on a subway bench tapping my knee while singing, wait a second… :). 8th day behind Benny on this song is so befitting. Great composition! Listen for the ending, you think it’s over, but then it comes back and “electrifies” you. Kol Isha: From the echoing a capella opening, it is clear this country song with a 60’s feel to it is unlike anything else in Jewish music. But wow, does it work. With harmonies by the very talented 8th Day, this feel good song is one of the best on an album jam-packed with hits. Love the piano interlude at 2:14. Make sure you don’t miss the final ending to the song, which seems to stop at 3:06 but continues on again at 3:11. Hislahavus: Ahh! Good stuff! 8th Day joins Benny in this classy, jazzy piece. I expect this song to become a staple at Kumzitses and Jewish jam sessions. Making it particularly delectable are the alto sax and piano solos – sweet, smooth, and solid. Check out the background harmonies! 8th Day picks it up, singing along with the brass at 2:35, which sounds perfect. Awesome execution. LETOVA – Composed by Oriel Avraham. Arranged by Ian Freitor and Leib Yaakov Rigler. JMDerech: What an ominous intro. Scared me, sheesh. I love how Benny mumbles the refrain, making all those words sound as one. The chorus is easily the best sound on this album, giving this song my favorite pick! Kol Isha: From the opening notes which sound straight out of a horror movie, this song just screams “fun!” and I fell in love with the minute I heard it. Given the funky nature of this song, I would have gone with Yitzy Spinner on the choirs to give the harmonies a little more edge. Love the bridge at 3:01 – soooooo well done. I just love this song! It is positively electric and how can you go wrong with those lyrics? We keep putting this one on repeat. It is just that good. Hislahavus: Letova hits five stars again – this is probably going to be everyone’s favorite tune. A bit of jazz influence in the vocals, although the choir showcases its lack of vocals vis a vis Benny’s phenomenal vocals. The tune is so catchy, and so much fun! BATUACH ANI – Composed by Yitzy Waldner. Arrangements by Leib Yaakov Rigler. JMDerech: There is so much falsetto in this song. I feel like I’m swimming in a sea of beautiful sound. There’s nothing crazy about this composition, but it all fits so perfectly. It reminds me a little of Re’faeinu from the Miami Boys Choir Shabbos Yerushayim album. Don’t ask how, it just does… This song concludes the “Instant Hits”. Kol Isha: Benny matches his voice perfectly to the poignant and heartfelt words in this touching song. It gives him a chance to show just how much he is capable of and it’s hard not be moved by this song. Moishe Roth’s choir really shines in this one. Love the yud gimmel middos in the background starting at 5:16. A great touch: fresh, unconventional, yet doesn’t in any way take away from this soulful song. I would have ended this song at about the 6:00 mark, with Benny’s vocals fading out, but apparently the powers that be disagreed with me on that one. Hislahavus: Batuach Ani uses the incredible lyrics from my favorite piyut in Ne’ilah. Listening to how effortlessly he swings up and down the octaves is just phenomenal. And compare what he does here to his first official release in Chasoif. He’s come so far in just one year, and that’s despite the fact that he did a good job in Chasoif! EMES – Composed by Yitzy Waldner. Arrangements by Ian Freitor. Lyrics by Lipa Schmeltzer and R’ Manis Friedman. Kol Isha: It was hard for to connect with this song with lyrics by Lipa Schmeltzer and Benny’s father, the esteemed R’ Manis Friedman, not because I have any problem with it musically, but because I don’t speak Yiddish, a serious liability for a Jewish music writer in this day and age. Doesn’t matter. It is a great song and Benny seems to really be enjoying himself here. The perfect finish to an awesome album. Hislahavus: LOVE the lyrics here – great rhymes, awesome message for the times. And another jazzy, fun flavored melody, with Benny putting on an awesome vocal show at the 3:00 point. Kol Isha: Benny is awesome. This is one CD you don’t want to miss. Hislahavus: Tachlis, for me, as Benny matures in his personal taste and style, we’re going to see some really unique stuff. I never took the Facebook group before that states “Benny Friedman is the future of Jewish Music” very seriously, but now I’m believin’ it. Mendel the Sheichet’s technical review of Taamu! Just to note: The song Hameracheim really shows the enormous vocal capabilities of Benny, being able to fly between his full voice and the soft falsetto in a snap is really incredible! While I love these reviews and agree with most them, II could not disagree more in regards to Hameracheim. Love the cd. I would just love one yossi green song to top it all off.